Tourism is the main economy, boosted by celebrity regulars like actress Sharon Stone and the Clinton family. Martha's Vineyard is far less developed than Cape Cod, but more sophisticated than neighbouring Nantucket Island. Holidays here are dominated by simple pleasures such as the weekly farmers' market, and walks on the miles of coastal pathways. Although it is a peaceful place, Martha's Vineyard does host many events in the summer months, which keeps things lively; however, the influx of people in summer raises prices and makes things less serene so that some travellers prefer to visit off-season. Visiting outside of the busy summer period (June to August) also increases the chance that some of the private beaches in the area will be open to the public. The six towns of Martha's Vineyard have distinct characters. 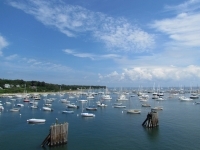 Upmarket Vineyard Haven is the island's main port, receiving ferries as well as private yachts. The fun centre of Oak Bluffs is home to the old Flying Horses Carousel, pizza take-aways and ice-cream parlours which cater to the young and carefree. The graceful Edgartown has quaint inns, historic whaling captains' homes and stylish boutiques lining the narrow streets, and is the island's oldest settlement.